I love creating art!! Especially when it touches other people and they feel inspired. Between the creation process and sharing my artwork with others, I feel very fulfilled in my life. Etsy was the very first online shop that I opened. Once I figured out how to network, I realized it is an incredibly supportive place to sell one’s handcrafted items. Conundrum I is a mixed-media painting that I created. It took over 100 hours to put it all together. This is also my signature piece … and very special to me because my Mom was involved in helping to motivate me when I started to get bogged down. I feel this is partly a tribute to my Mom! In my Etsy shop I offer my paintings in a variety of ways. Art Cards, ACEOs are little pieces of artwork (2.5″ x 3.5″). 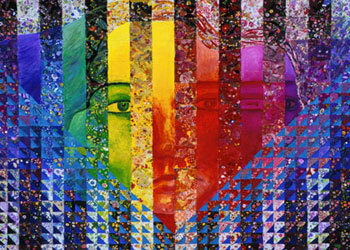 They are a more affordable and convenient way to collect art than some of the larger pieces. Consciousness is part of my Bubblescape series. 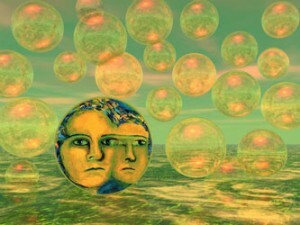 I hope that you will feel moved to develop your own Consciousness as you meditate on this image. You can also see the faces of Anticipation in this Bubblescape. Also, it is beautiful and fun! I also sell my images as 5″ x 7″ fine art greeting cards. As one friend said, “Each card is a gift in itself”. These vibrant cards make a nice touch to send to anyone. 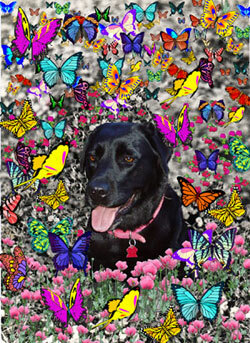 Abby in Butterflies showcases a black Labrador Retriever surrounded by a field of butterflies. Bright and colorful butterflies can brighten up any day. Abby is part of my Fanciful Animals Images series. 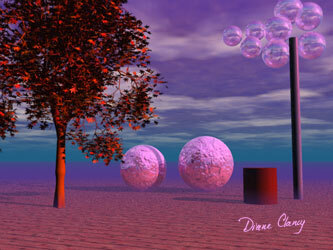 All my art is also available as archival fine art prints – matted, unmatted, framed, unframed. I offer a variety of sizes. Evening Stroll shows two beings walking together in life through a glorious evening. They are meant to be delightful and uplifting to you. I hope you will find my art enhancing your life! Ask for what you don’t see!